PACK MULE provide longer runtime and increased safety. PACK MULE's NXG Stock Chasers are versatile utility vehicles capable of delivering needed materials through cramped aisles and tight corners. With an integrated ladder, adjustable back rest and comfort matting standard features, the NXG Stock Chaser offers a superior solution to increase productivity in any warehouse or facility. Having the best warranty means having confidence to get the job done. Because of our successful track record, more reliable components and our superior build quality and design, Pack Mule confidently stands behind our products with a warranty that proves it. A vehicle or towable cart that is out of service can cause a ripple effect of production loss and increased expense throughout an entire facility. We recognize the importance of keeping your vehicles and towable carts running at peak performance. That's why we build them the way we do. 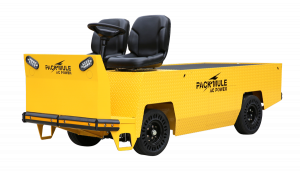 Since 2012 Pack Mule has backed it's electric utility vehicles and towable carts with the only three-year warranty in the industry, but there's so much more to a warranty than just years of coverage. In the chart below you'll find a few key differences between Pack Mule's it's and competitors' warrantees that you won't find out until you read the fine print. The differences may surprise you! *For an added cost, Columbia offers warranty extensions to two-year/3,000 hour limit or three-year/3,500 hour limit. Not only does Pack Mule cover almost 10,000 hours more of potential use, it pays full shipping for parts and repairs, which can potentially save you hundreds or even thousands of dollars. As always, we welcome manufacturers to contact us directly with updated and/or corrected data. Pack Mule uses a 3-phase AC induction motor that provides up to 40% greater efficiency than its DC counterparts. It creates significantly more torque, faster acceleration, and—since it has no mechanical connections and is sealed, protecting it from dust and debris—it’s maintenance free. These are the same reasons that Tesla and all other major auto makers producing electric vehicles are using AC motors. For years, AC power has been an expensive, added-cost option on electric utility vehicles. By focusing on AC power we've succeeded in eliminating the upgrade cost and have created our most powerful, safest and most reliable vehicle to date. Here are a few more reasons why Pack Mule’s new NXG Series of AC vehicles is better, some directly and others indirectly attributable to the use of AC. Pack Mule made AC power standard on all its vehicles to improve performance, lengthen component life, reduce maintenance, and increase safety. AC powered motors directly and indirectly provide up to twice the run time between charges. While the AC motor itself enhances run time by 20% to 40%, the Pack Mule’s AC system enables enhanced regenerative braking, programmability and control of operation that boost the Pack Mule NXG advantage further to up to around 100% more run time. This provides everyday benefits, such as fewer interruptions in operations to charge the vehicle. And, since all batteries have a limited number of charge cycles, fewer charges per day means longer battery life. Since Pack Mule vehicles generally last well beyond 10 years, the savings in battery replacement costs alone could be in the range of $1,600-$3,200 over the life of each vehicle. The AC motor enables more efficient kinetic energy harvesting. The benefits of Pack Mule’s dual regenerative braking, automatically engaged whenever the operator’s foot is lifted from the accelerator, are greater runtime (since the kinetic energy is returned to the batteries), longer brake component life (since regenerative braking is wear-free and maintenance free), and much safer operation, because the extra braking can provide shorter stops when the vehicle is heavily loaded, towing a large load, or going down an incline. Pack Mule’s AC motors are maintenance free. DC motors usually present at least two maintenance challenges: they are not sealed because of required ventilation, making them subject to contamination from dust, debris, fumes and moisture, and they contain brushes which must be periodically inspected and replaced. Pack Mule’s AC motors are virtually maintenance free. They are sealed against outside contamination, and there are no brushes to replace. AC motors are safer in operation. DC motors can produce arcing, sparks leaping from the brushes to the commutator, making them hazardous wherever flammable vapors are present (as they often are when batteries are charged). AC motors don’t arc, removing the danger of explosion. AC’s torque characteristics reduce drive train wear. The torque-producing characteristics of AC motors are much better aligned with the real-world operation of electric utility vehicles. DC motors deliver very high torque when moving a load from a standing start, generating unnecessary wear on the vehicle’s drive train, shortening its useful life and increasing maintenance costs. AC power enables intelligent braking. Because AC motors can be controlled more effectively by on-board computers, they can ensure smoother stops and changes of direction. This makes the vehicle safer for both the operator and the cargo. AC vehicles can be profiled to your specific environment. The operating specifications of each vehicle can be programmed to fit the needs of your environment, resulting in more efficient operation, less wasted energy, and increased safety. For instance, speed acceleration parameters can be programmed to fit each application’s workloads, safety regulations, tightness of turns, vehicle routing, and other environmental factors. AC provides continuous power for loaded startup and hill climbing. The torque dynamics of AC motors provide for power when you need it, such as at start-up and when going up inclines. This isn’t available with DC motors. Load range C tires (vs. industry standard load range B tires) which are safer and allow for much higher psi inflation, reducing roll friction and increasing runtime. Sealed transaxle, wheels, and motor requiring no maintenance. Industry leading 3-year warranty with no hours of use limit (vs. industry standard 2 year warranty). Specifications PDF 31.5" 48" 55" MINIMUM TURNING RADIUS of any stand-up tow vehicle. Specifications PDF 31.5" 58.5" 65" MAXIMUM CARGO DECK & WEIGHT CAPACITY PLUS 2,000 LBS. TOWING! Specifications PDF 31.5" 58.5" 65" MAXIMUM CARGO DECK SPACE & WEIGHT CAPACITY PLUS 6,000 LBS. TOWING! TRY PACK MULE IN YOUR FACILITY. NO COMMITMENT REQUIRED.